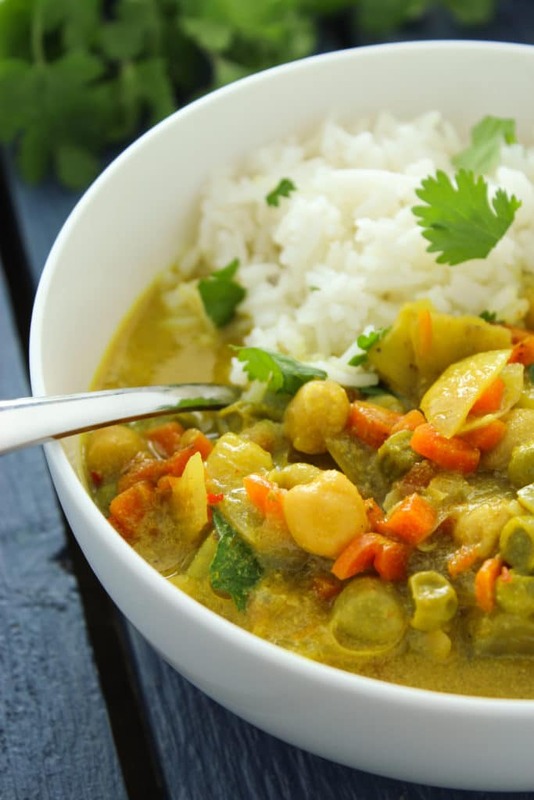 This crockpot coconut curry recipe is mildly sweet with a pleasant hint of spice. It’s made with simple ingredients and comes together quickly. Vegan and gluten free! I’m hoping you haven’t noticed, but you probably have – you guys are a bunch of smart cookies. A lot of our recipes have curry in them and this one is no different. The love affair began when I was sick in Brooklyn that one Christmas and Indian food healed me, body and soul. I’m certain of it. And since then, curry has found its way into our lives almost on a daily basis. It’s not always in form of a steaming bowl of hearty, creamy stew like this recipe. Sometimes it’s in the form of spiralized baked fries, or crunchy roasted cashews, or even turkey meatballs. If there’s a way to incorporate curry, we’ve got the will. For a while, we were obsessed with French food. After Mexico, it was obviously, Mexican food. But for now, in the dead of winter, it’s sweet, sweet curry. Bonus: I hear it’s good for the immune system. PS – This recipe is particularly exciting because we made a video for it! You can check it out here and, if you’re feeling super nice, share it, too!  Making videos was one of our 2016 goals and this is already our second one. We’re finally getting up to date with the times! If you don’t already have a crockpot, we recommend this one from Amazon. It’s a great value and has the highest ratings! 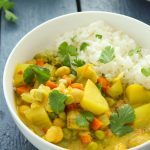 Made with just a few wholesome ingredients, this mildly sweet, savory curry comes together easily in your crockpot. 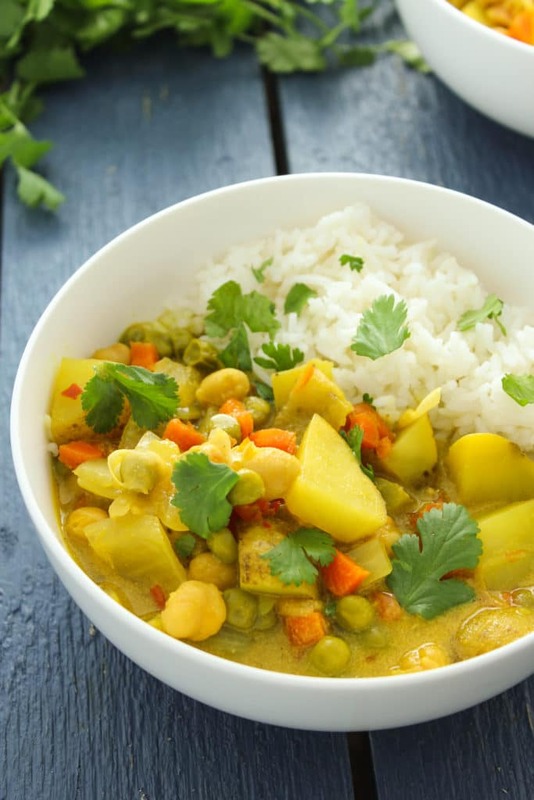 Combine potatoes, carrot, peas, chickpeas, onion, vegetable broth, coconut milk, curry powder, sea salt, ginger powder, coriander, and red pepper flakes in a crockpot and stir to combine. Serve as desired – we recommend spooning it over a bowl of fluffy, hot rice. When made following the recipe, how spicy is this? Also has anyone tried using lite coconut milk? This curry is more on the mild side. It has a hint of spice but it’s not “spicy” by any means. I have not tried it with light coconut milk, but I typically recommend using whole coconut milk for the richness. I am allergic to coconut, could I use regular milk or soy milk? Of course! I would recommend subbing in almond or soy milk. So yummy!! What is the serving size? I know it yields 8 but like is it a cup or? The coconut milk curdled for me. Hi! I am just preparing this dish now. I too have to cook it much longer than 2 hours, as the vegetables still aren’t cooked after 3 hours on high. But it smells delicious! I am just wondering, would it be possible to make it milder (for kids)? Would adding just 1 tbsp of curry instead of 2 tbsp work? Thanks so much! So … the flavor is really good but — after 2 hours, the small-chopped potatoes and carrots are still hard. Was I supposed to cook them first? Hi Erin! That’s strange. Ours only took 2 hours on high to cook the potatoes and carrots fully. Every crockpot is different, but I would just suggest cooking it longer.